An research programme was undertaken amongst staff, patients and carers to understand how both groups perceived the way the hospital and its staff worked. The results enabled a creditable framework of values and behaviours to be produced, crucially chosen by the staff themselves and therefore maximising the likelihood of successful implementation and subsequent improvements to morale and patient care. We wanted to celebrate that these values had come from ‘within’. They weren’t imposed from above; they were something that came ‘naturally’ to many staff with the desired behaviours already being exhibited in different parts of the Trust. Our creative concept and employee engagement ideas took this premise and focused on a ‘nature’ theme. We used bespoke illustrative flower imagery and colours to create a high impact, universally accessible style (i.e. no clichéd ‘NHS’ images). It’s a reflection too of the hospital’s much admired formal and wild flower gardens and has allowed us to create a wealth of innovative campaign collateral to help embed the messages. 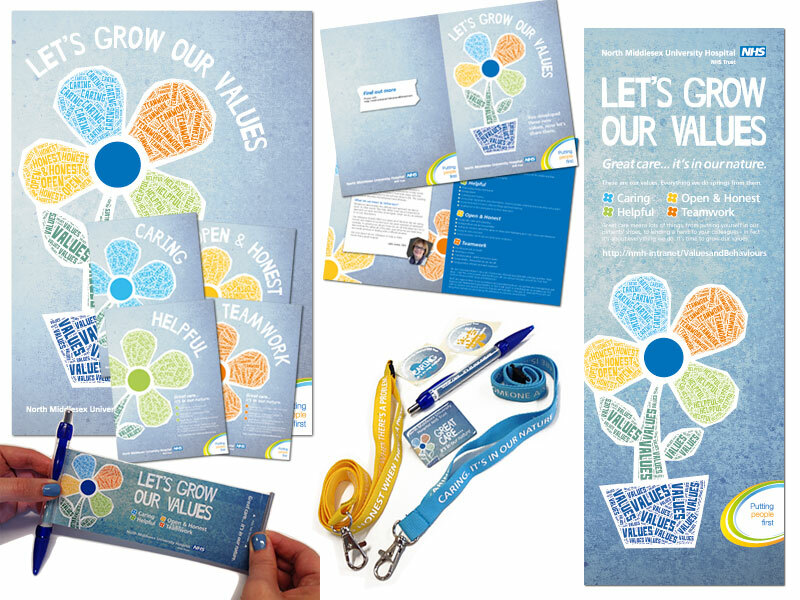 Each colour links with a core value – Caring / Blue, Helpful / Green, Open & Honest / Yellow and Teamwork / Orange. This has also helped us to produce segmented campaigns as required and embed the values on a subconscious level. We produced material to support all three stages of the campaign (launch, promotion and celebration) including posters, pull-up banners, intranet collateral, email content, leaflets, staff giveaways and event promotional items. Our future work will include innovative long-term promotion and colour matching of values, including lighting changes in the main reception, tree and flower planting and even laser-etched fruit! The biggest landmark so far has been the Trust’s first Employee Recognition Awards, held at Alexandra Palace and attended by nearly 350 shortlisted candidates, colleagues and sponsors.. WDAD project managed the event for which over 200 nominations in 10 categories were received. Feedback from the Trust has described the event as “phenomenal” and the post-event working atmosphere “buzzing”, creating a fantastic platform for the scheme’s continued roll-out.